Guest blog post by Katy Locke, originally posted on the Keene Transition Movement's Community Website and Blog, January 28, 2010. Over 40 folks from Sonoma Valley, the Bay Area and beyond attended the two-day, one-evening workshop,Training for Transition: Building Resilient Communities for a Post-Carbon World. Among the participants were Mayor Laurie Gallian, and Councilman Ken Brown. Owen Dell, landscape architect in Santa Barbara and author of Sustainable Landscaping for Dummies, recently wrote a blog post he refers to as an exposé of rain barrels. Basically, his conclusion is that the current popular status rain barrels have attained is misplaced, and rain barrels don't make sense. 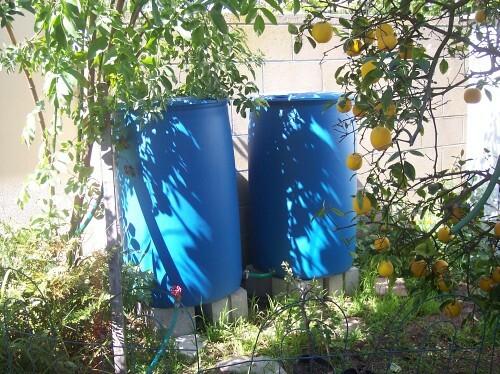 I currently have eleven 55-gallon rain barrels around my Los Angeles property, and probably will acquire more. At first I bought a few of these for my then-preteen-age-son, who had outgrown Legos and needed a larger scale project. But soon after I got them, I began to glimpse the wide range of functionality. Call me a day late and a dollar short. Or maybe behind-the-times with respect to Facebook. But I completely missed the posting blitz where Facebook fans used the "urban homesteading" term as many times as they possibly could in a single day. In fact, I learned about the posting blitz via our Transition U.S. newsletter, which, when I opened my email, at first shocked me with the brazenly open use of the term. I'd heard about the urban homesteading controversy itself, of course. Much of it is unfolding in my own hometown, the greater L.A. area. I bought a new pair of shoes lately. All my friends gleefully applauded my purchase, and my husband was very pleased too. You see, about three weeks ago, while on the construction site for the new community garden we're building in my neighborhood, I sprained my ankle pretty badly. Limping awkwardly, I discovered very quickly that I simply didn't have the right kind of footwear. City shoes, even "practical" shoes with just a little bit of heel don't work with an injury, and you can't grip a slide-style shoe when you're sporting an ace bandage. That got me thinking about Transition footwear.